Around this time, it was decided that the Omni should be replaced by a new arena. The Omni was designed with weathering steel that was intended to rust into a seal around the arena so it could last for decades. However, the designers and architects didn’t reckon on Atlanta’s humid subtropical climate. As a result, it never stopped rusting, and looked somewhat dated despite being 25 years old. When Turner won an NHL franchise, the Atlanta Thrashers, one condition was that a new arena had to be in place before the new team took the ice for the first time, as The Omni was unusable even for temporary use. Eventually, it was decided that The Omni would be demolished and a new arena for the Hawks and the expansion NHL Thrashers would be built on the same area. 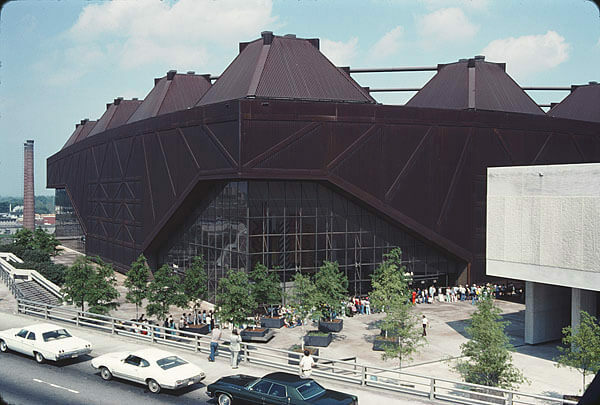 Following the 1997 playoffs, the Hawks moved back to Georgia Tech’s Alexander Memorial Coliseum, with the Georgia Dome used for larger-capacity games, until Philips Arena opened before the 1999–2000 season.